THEN AND NOW: The denuded slope above Namche Bazar in 1983, and the new pine forest. The sound of yak steps on cobble stone streets and their jingling bells in Namche Bazar were familiar sounds. What was less familiar 35 years later was the constant clatter of helicopters overhead. 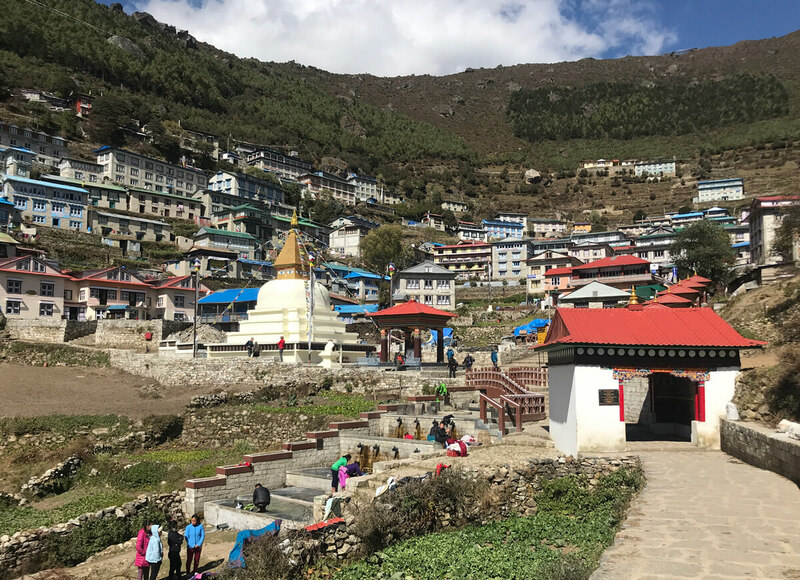 This contrast between old and new was an ever-present theme during a recent trip to the Khumbu — a return journey to the region after my first visit in 1983. 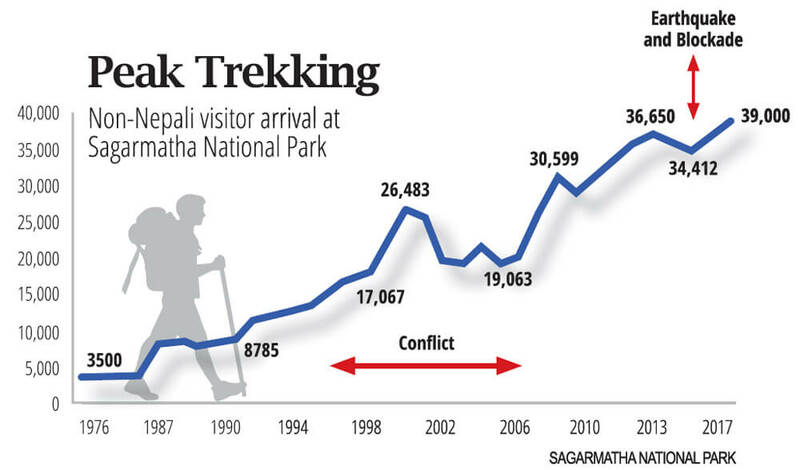 There are many more trekkers, and new hotels to accommodate them. 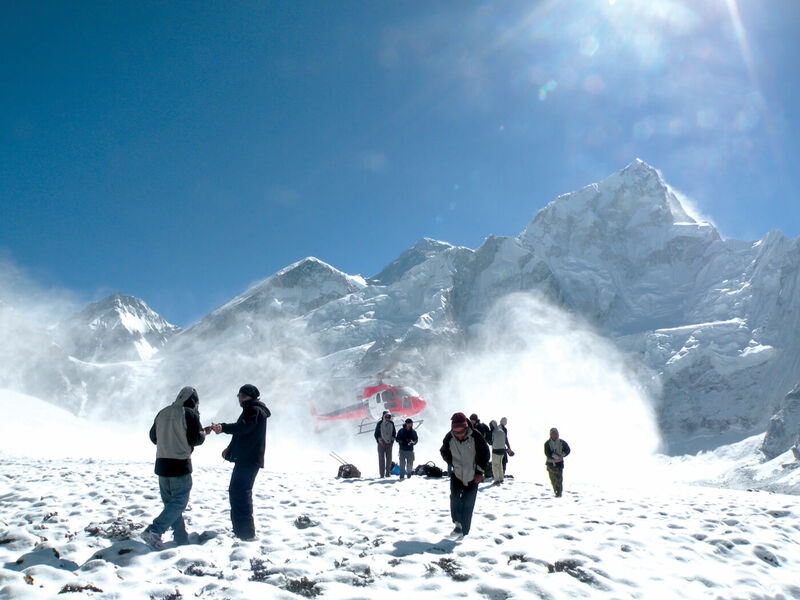 The Everest Base Camp trek remains the main attraction with guides and porters carrying gear for primarily European and American visitors. I had come here in 1983 to study the overuse of firewood, and the resulting deforestation. 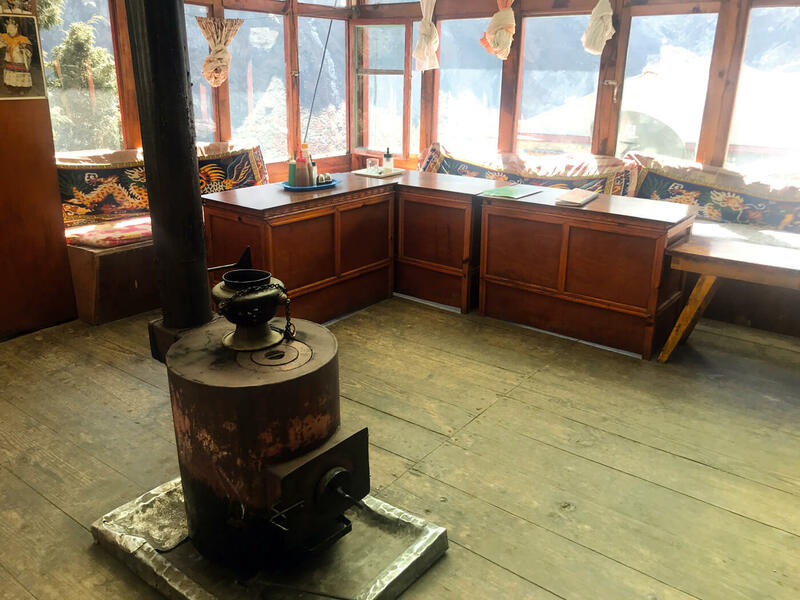 I lived with a Sherpa family that ran a small trekking lodge in Namche, and firewood was their main source of energy for cooking and heating. Without proper chimneys, smoke filled the living spaces and exposed residents, especially children, to respiratory problems. The chief warden of the Sagarmatha National Park then was Mingma Norbu Sherpa, one of Nepal’s Conservation Heroes who died in 2006 in the helicopter crash in Ghunsa. He took the leadership to protect the forests, and Brot Coburn, a UNESCO consultant, helped build the first micro-hydroelectric plant below Namche that provided electricity for lighting and some cooking 16 hours a day. 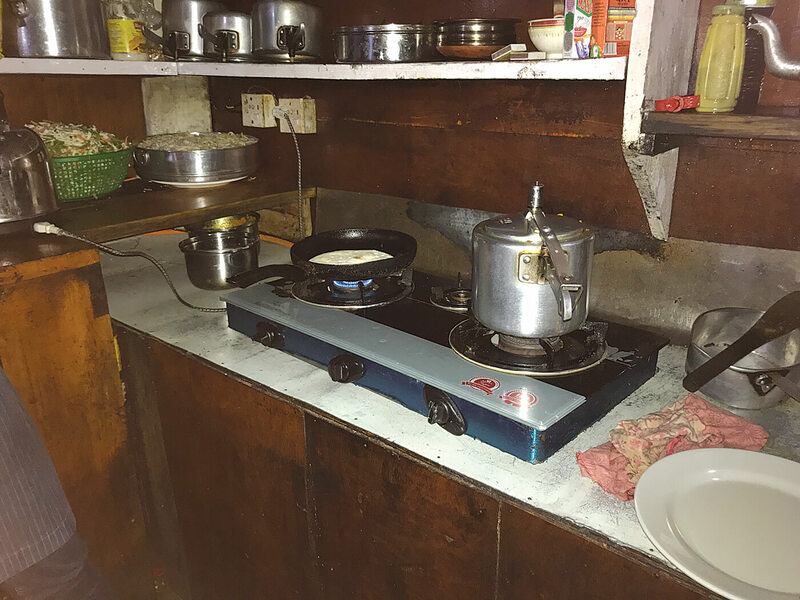 WHAT’S COOKING: Smokeless yak dung stoves are used for heating in most trekking lodges today. 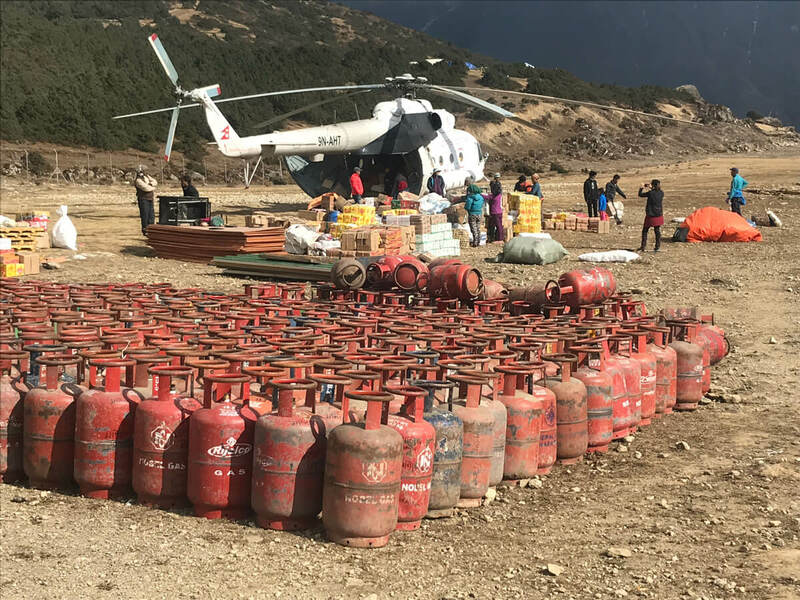 Russian Mi-17 helicopters fly in LPG cylinders to Syangboche from Phaplu. Both have contributed to lessening the pressure on forests. The favourable energy shift towards forest protection and electricity picked up momentum from the late 1990s with the introduction of metal stoves that used yak dung for heating. At the same time, LPG cylinders started appearing for home cooking. Local hydro capacity was expanded for more sustained use in lighting and electrical appliances. Thirty-five years later, there has been dramatic re-growth of forests. Areas above Namche that were virtually barren in 1983 now have tall pine forests. Trails from Namche to Phortse and Thame have robust stands of diverse tree species. Firewood use is much reduced due to the high cost of local labour to collect it, and because propane is a cheaper fuel source. Reductions in livestock herding and the success of community forestry have helped revive ecosystems. 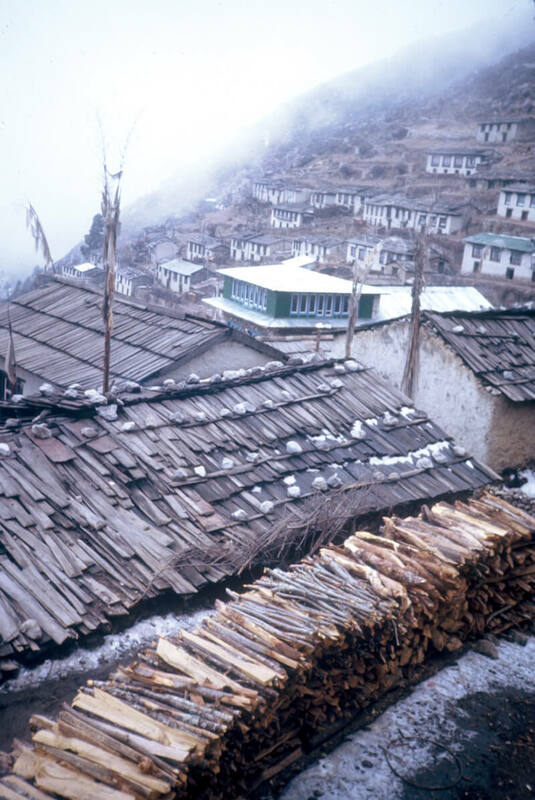 Fuelwood in Namche 35 years ago, and yak dung drying in Khunde today. 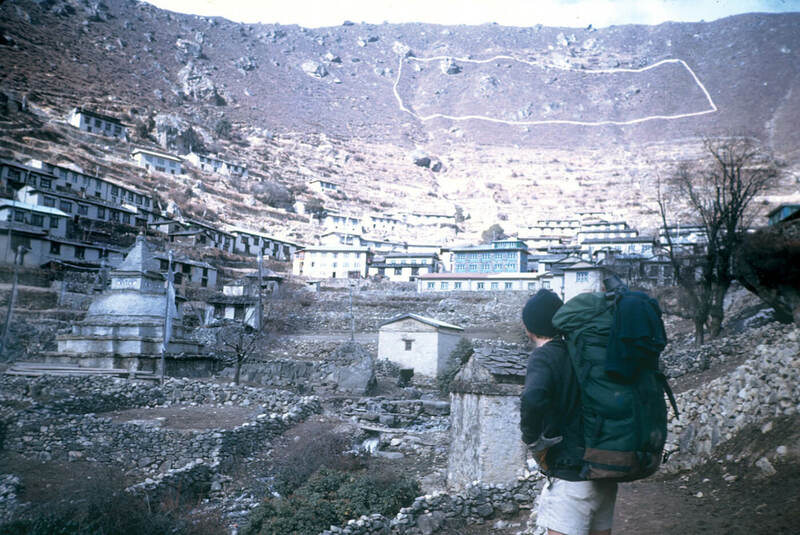 In the early 1980s, communication to and from the Khumbu relied on runners transmitting messages by foot, a single telephone line at the police station in Namche, and a postal drop at the Khunde clinic. Today everyone has a cell phone. 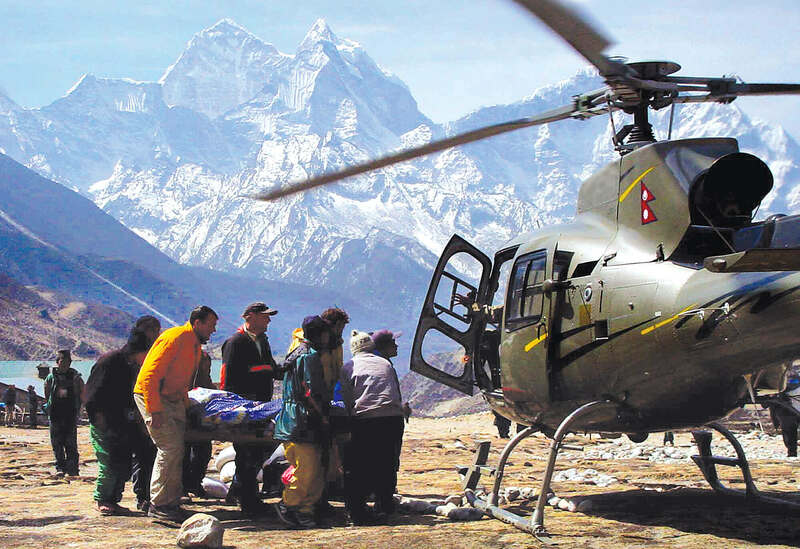 Porters carrying incredibly heavy loads chat with friends and family. Trekking lodges advertise WiFi service with more emphasis than their hotel rooms. At the monastery in Thame, a young monk in a maroon chuba and matching down jacket showed me hand lettered 600-year old books with ancient Tibetan calligraphy. He interrupted our conversation to take a call on his smartphone. 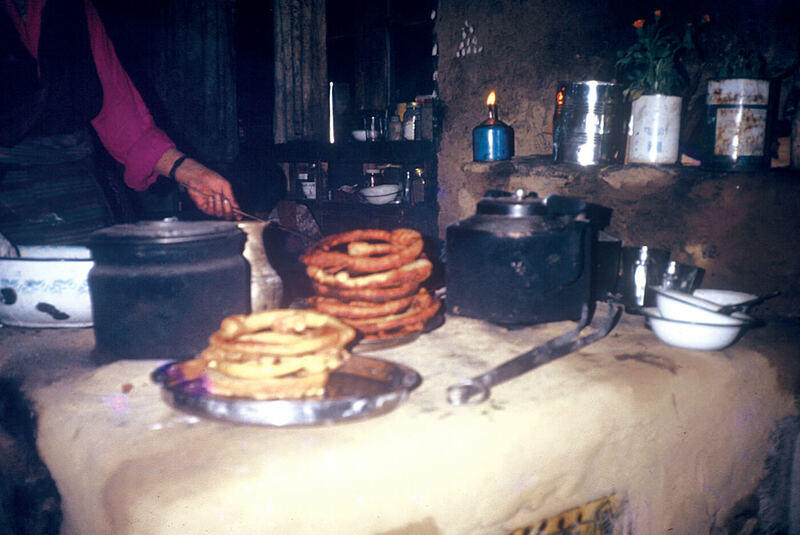 A Sherpa lodge in 1983 burned firewood in smokey clay stoves, the walls are blackened and a propane canister is turned into a kerosene lamp. Gas stoves have replaced the mud chulo today. One troubling trend is the increasing reliance on long mule trains to transport supplies. Travelling in trains of 20 or more, they stir up dust on the trail and leave an overpowering stench of waste. 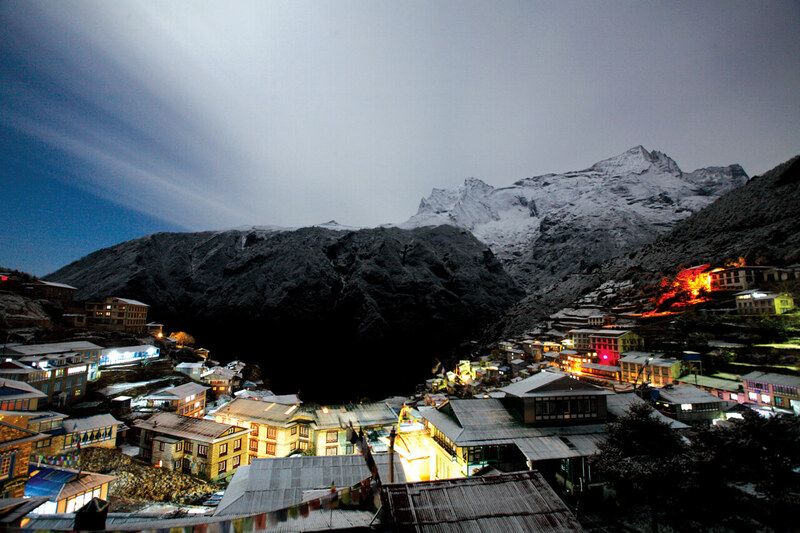 Locals are discussing a proposal to build a cargo cable car from Lukla to Namche. The Sagarmatha Pollution Control Committee is removing garbage and human waste from Mt Everest. Base Camp is supposed to be cleaner, and recycling bins are common along the trails. Yet, there is still extensive litter because packaging waste is accumulating faster than it can be disposed of. Meanwhile, Nepal is racing to develop its hydroelectric capacity, and one consequence could be that rivers flowing from the Sagarmatha National Park could be dammed. This World Heritage Site deserves permanent protection. 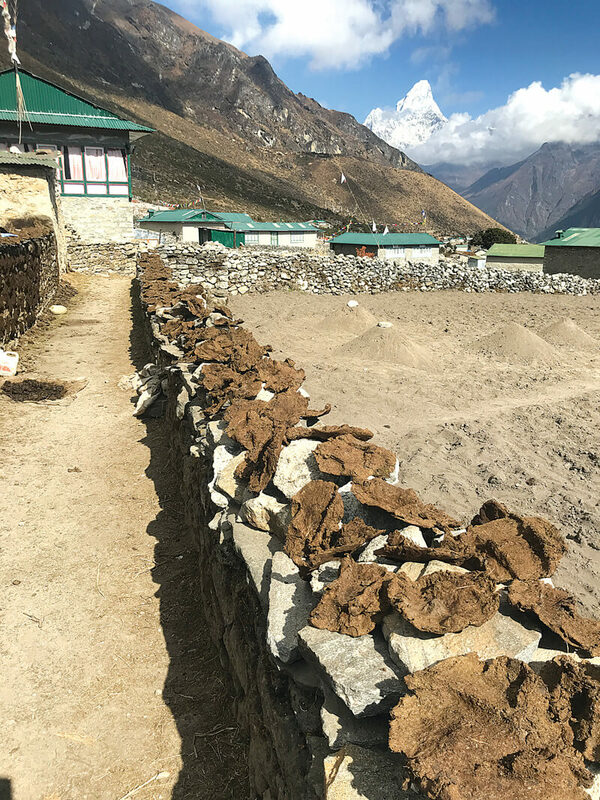 How residents, local and national authorities manage the Khumbu’s environmental and energy resources amid pressures of growing tourism and hydro development will determine if the region can have a sustainable future. Adam Stern is an American environmentalist based in California.